So, I decided to add a new section on product reviews--yayyy! After all, there's nothing more I love than trying and falling in love with new products (that's why I love my Birchbox subscription so much!) This is a very special post because it is the first one of its kind on my blog. First and foremost, this post was made possible due to the generosity of the founder of Slice, who sent me a pair to demo and review, as well as my friend Kim for putting the two of us in touch, always recommending great beauty loot, and inspiring me to branch out in a new direction on MIWS. So a big thank you to both! -Design: They are big--but where it matters most. The size didn't obstruct my view when I was plucking my eyebrows with these bad boys. They are comfortable to hold in your hand and easy to control. They were designed by famed architect Michael Graves! -Ease: They are made of a rubberized finish, so they don't slip out of your hand--which is perfect for klutzes like myself. -Precision: The tip is slanted, so I was easily able to pluck those stubborn little hairs that normally are not even long enough to pluck as they are growing back in. -Sanitary: These are easy to clean--I just used an alcohol wipe to clean the tip, which is made of stainless steel. -Sharp: If you aren't using these for beauty purposes, but to remove a sliver, for instance, you won't have any trouble at all! I have used dull tweezers before that have had a rounded tip, and they are not the greatest for eyebrow plucking or removing slivers. -Color: Because who wants another boring, silver pair of tweezers? I love the bold pop of red, and it makes it easy to find in my makeup bag. On a scale of one to ten (with one being the worst and ten being the best), I would give these Slice tweezers a nine! I would highly recommend them as an essential tool to any beauty arsenal. 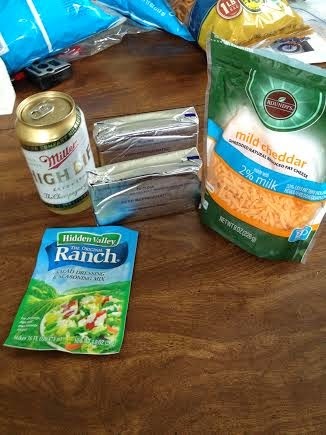 Being a Wisconsinite, I love to take pride in all things Wisconsin--especially cheese, milk, and beer! 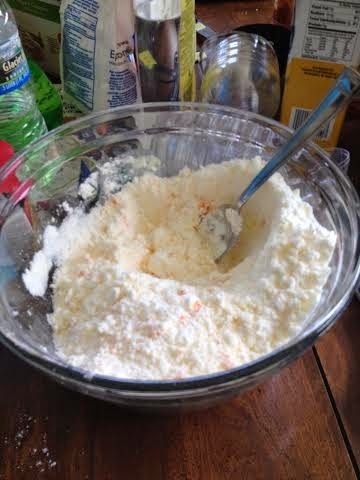 I found this recipe on Pinterest and gave it a try--it was such a hit at my cousin's 4th of July party, I had to make a batch just for our family to snack on! 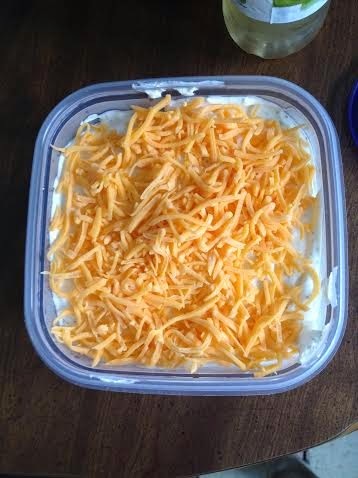 I love dips, and this is a really simple one. 1. Let cream cheese sit out until room temperature (I heated mine in the microwave for like 2 minutes because I was impatient!) 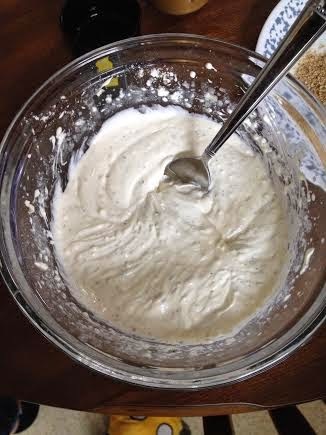 Combine cream cheese, beer, and ranch seasoning in a bowl and mix well. 2. 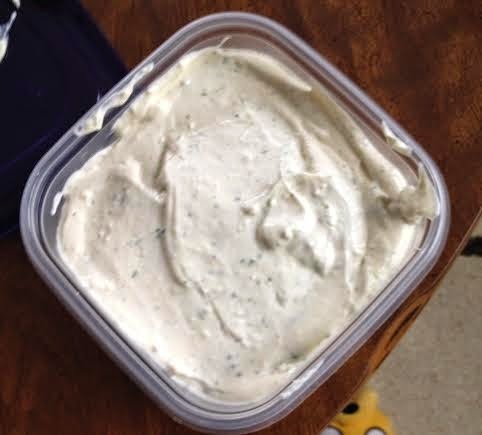 Transfer dip to a Tupperware container. Place in fridge for 2-3 hours. 3. Before serving, top with shredded cheddar cheese. Serve with pretzels or chips. I am not a fan of wearing socks, as much as I can possibly get away from it. I even own those little nylon socks that barely show in flats, but they always irritate me, bunch up and don't stay in place in my shoe. So naturally, my shoes can get a little smelly when my feet sweat. I saw this great trick on Pinterest, and it really works! I do this after I take my shoes off and put them on the shelf. 1. Add 3/4 of your spray bottle full of water and the remaining 1/4 full of rubbing alcohol. 2. 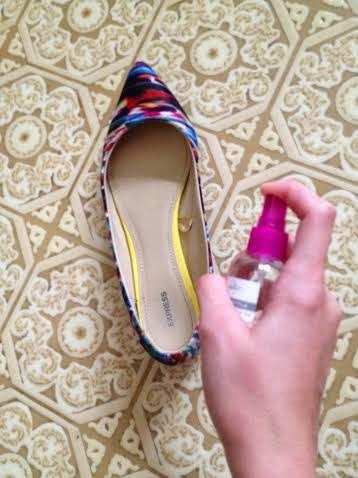 Before use, shake well and spritz 2-4 sprays inside the shoe and let air dry. 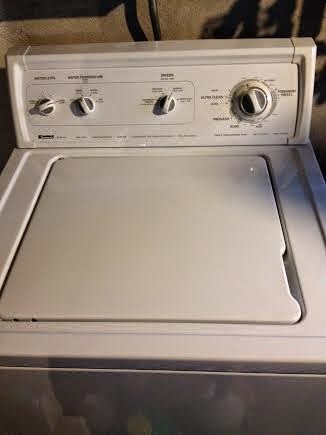 When I was doing my laundry recently at home, I couldn’t help but notice that the washer was a little…well, gross. It needed some TLC. I remembered seeing instructions on how to clean a washer on Pinterest, and decided to scrub that bad boy from top to bottom. After all, what’s the point of washing clothes in dirty water and bacteria? The total cleaning takes 3 cycles, but you really only need to do it twice a year, which I can definitely handle. 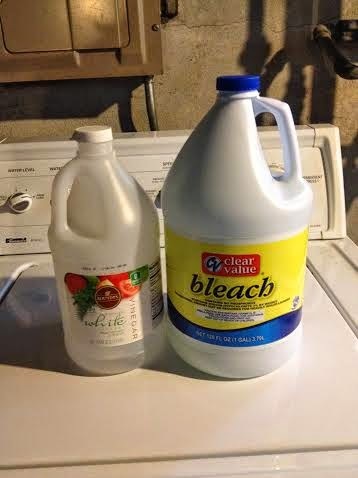 The bleach and vinegar kill the bacteria and get your washer sparkling in no time. Trust me, you don't want to see the before picture! 1. Scrub any visible dirt/mildew out of the inside of the washer (including agitator) with a magic eraser. 2. 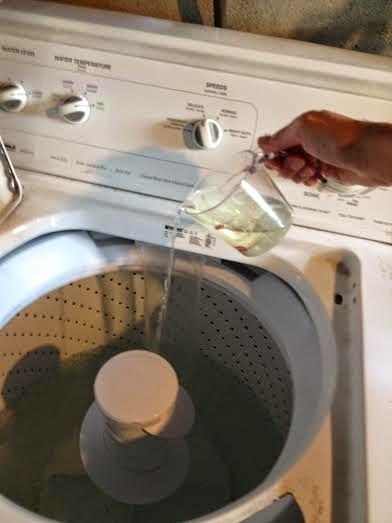 Fill washer with hot water. Add in one quart of bleach. Let washer agitate for one minute. Then, let sit for an hour. Use washer’s longest cycle to rinse. 3. Fill washer with hot water. Add in one quart of white vinegar. Let washer agitate for one minute. Then, let sit for an hour. Use washer’s longest cycle to rinse. 4. Now, while I was waiting for that second hour to pass, I actually removed the bleach tray and cleaned it and scrubbed down the outer surface of the washer. I detailed it by getting in all the nooks and crannies with a magic eraser. 5. Use the washer’s longest cycle to do a final rinse. That’s it! Now you are good for another solid 6 months. Ok, I admit that I am a little late to the game, but I didn’t know what Lush was until I did my summer internship in Montreal back in 2007. We didn’t have any close by in Wisconsin, but now we have one in Mayfair Mall. I like their stuff a lot, but man—it can be pricey! I got some bath bombs as a gift for Christmas a few years ago, and really, I like anything for the bathtub. 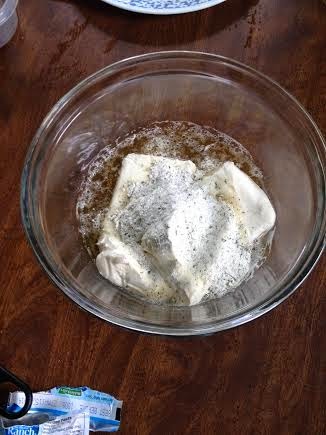 I discovered a DIY bath bomb recipe here and decided to give it a whirl. But before I jump into that, here are my learnings from this project: I recommend getting smaller ornament molds, as mine were HUGE! I ordered 80 mm ones on Amazon, and they kinda broke easily too. 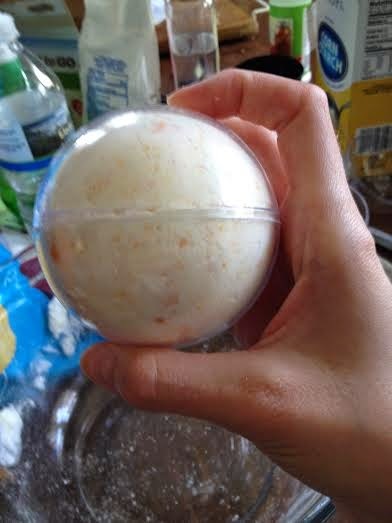 Big ones means you only make 2-3 bath bombs per batch, vs. a smaller mold of possibly many more bath bombs. Also, all of the ingredients together are a bit pricey. So, I guess the difference is spend the money at Lush and have someone else make them or spend it yourself and do all the work. But you do save a bit by DIYing. I would think plastic Easter eggs would make great molds also! Also, a little food coloring goes a LONG way! 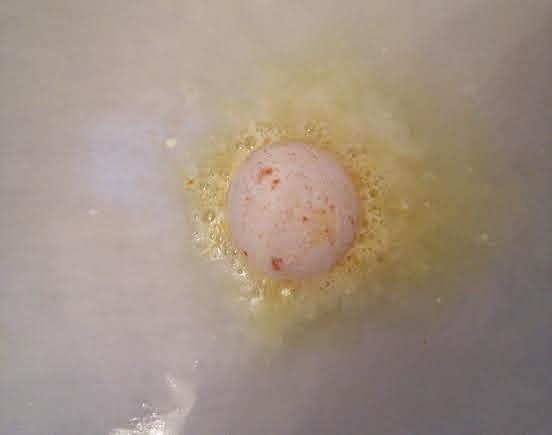 My bathtub water was super yellow when my bomb dissolved completely, but the color did not stain me or the tub. 1. 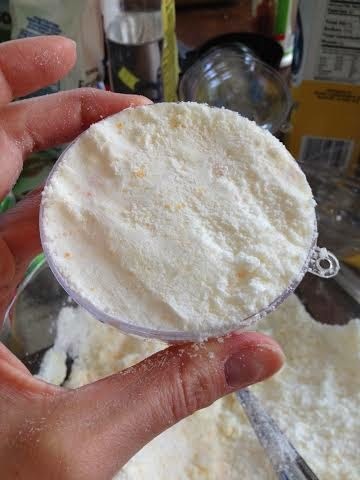 Mix the salt and all of the powder ingredients together (except the citric acid) in one bowl. Set aside. 2. Mix all of the liquid ingredients together (except the food coloring) in a separate bowl. Slowly add to the powder mix and stir gently. The consistency should be that of wet sand, where it sticks together somewhat. If it is not, slowly add a few drops of water at a time while mixing and squeezing it in your hand until it is like wet sand. Now add the citric acid and mix. Do not test the consistency with your hand, as the citric acid is abrasive. 3. Add the food coloring in last and mix well. I did blue for my lavender scented ones and yellow for my orange scented ones. 4. Fill one half of the plastic ornament past the edge with the mixture. Pack it down tightly. 5. Repeat with the other half of the plastic ornament past the edge. Pack it down tightly. Now snap the two halves together. Seriously, this was the hardest part for me because I could not get mine to snap together. I broke a few halves trying to do this. 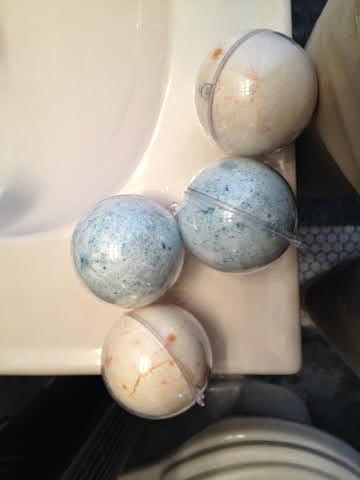 There should not be any cracks in the bath bomb once the halves are together—just a smooth finish on each side. It worked! 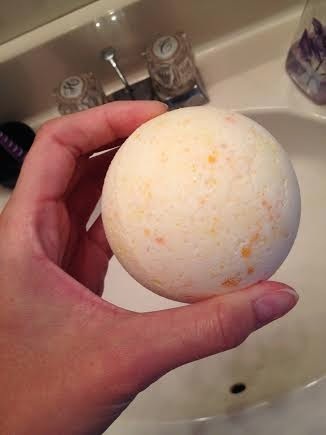 Fizzy and all, comparable to the real Lush one, like a big glorious citrus ball of bath time happiness.